The analysts of Persistence Market Research have adopted a systematic research approach while examining the global patient throughput and capacity management market in a recently published report titled “Patient Throughput and Capacity Management Market: Global Industry Analysis and Forecast, 2016–2024.” The expert team of researchers have used in-depth secondary research to arrive at the overall market size, top industry players, top products and industry association. Persistence Market Research has conducted extensive interviews with industry experts, players, distributors and retailers operating in the global patient throughput and capacity management market. While studying this market, the analysts have observed that patient throughput and capacity management solutions enable hospitals to increase per bed capacity and reduce the duration of hospital stay while improving revenues. The analysts have also observed that patient throughput and capacity management solutions are customized as per hospital requirements. They have further noticed that these solutions are based on various parameters such as workflow, beds, assets, patient care etc. ; however bed management remains the most popular criteria. Primarily, the report takes an overview of the global patient throughput and capacity management market. The overview consists of market taxonomy and a section that underlines factors influencing the development of the global patient throughput and capacity management market. This report covers the global patient throughput and capacity management market performance in terms of revenue contribution from various segments. 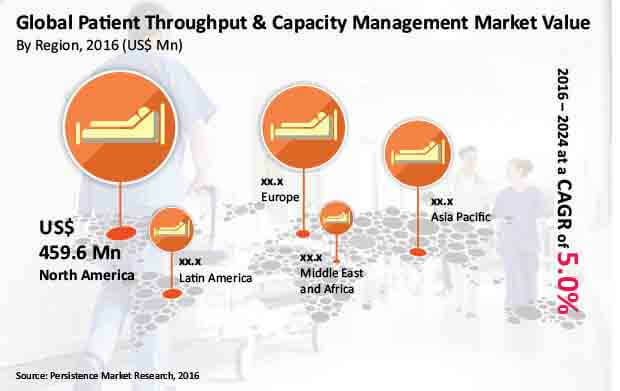 This section also includes Persistence Market Research’s analysis of key trends, drivers, restraints and opportunities influencing the progress of the global patient throughput and capacity management market. Impact analysis of key regional growth drivers and restraints based on the weighted average model along with key region-specific trends is included in this report to better equip clients with information and hidden insights. Towards the end of the report, Persistence Market Research provides key strategic recommendations for both existing and new players in the global patient throughput and capacity management market to emerge sustainably profitable. In the final section of the report, the global patient throughput and capacity management market landscape is included to provide report audiences with a dashboard view based on categories of providers across the global patient throughput and capacity management market, their presence in the global patient throughput and capacity management portfolio and key differentiators. The forecast presented in the global patient throughput and capacity management market report assesses the total revenue of the global patient throughput and capacity management market. When developing the forecast of the market, the starting point involves sizing the current market, which forms the basis for the forecast of how the market is anticipated to take shape in the near future. Yearly change in inflation rate has not been factored while forecasting market numbers. Bottom-up approach has been used to assess market numbers for each product category, while top-down approach has been used to counter-validate the reached market numbers. Indicators such as incidence of chronic diseases, growth in geriatric population, work related injuries, etc., have been considered to arrive at indicated market numbers. The historical market trend has been analyzed to track critical data pertaining to the global patient throughput and capacity management market. The report also takes into consideration year-on-year growth to understand the predictability of the market and to identify the right opportunities across the global patient throughput and capacity management market. As previously highlighted, the market for global patient throughput and capacity management is split into various categories. All these segments have been analyzed in terms of Basis Point Share (BPS) to understand segmental contribution to overall market growth. This detailed level of information is important for the identification of various key trends in the global patient throughput and capacity management market. In North America, the patient throughput and capacity management market is expected to register a CAGR of 5.0% over the forecast period. The market in the region is estimated to account for more than US$ 400 Mn in 2017 and is expected to be valued in excess of US$ 600 Mn by 2024. The North America patient throughput and capacity management market was projected to account for more than 50% share of the global patient throughput and capacity management market in 2016 and is expected to gain 17 BPS over the forecast period. The North America patient throughput and capacity management market is expected to represent incremental opportunity of more than US$ 200 Mn between 2016 and 2024. The patient throughput and capacity management market in Canada is predicted to register a healthy CAGR of 4.7% during the forecast period. The U.S. is likely to be the most attractive country in the North America patient throughput and capacity management market over the forecast period and is estimated to account for more than 80% of the North America patient throughput and capacity management market by the end of the forecast period. The U.S market is expected to continue its dominance over the projected period. Rising incidence of accidents, diseases, and trauma cases in North America has led to an ever-increasing patient pool. Despite this, the number of hospital beds and healthcare professionals is not increasing at the same rate, thereby creating a disparity between demand and supply, which can be better managed with patient throughput and capacity management solutions. Hence, increasing number of patients is expected to be a major factor driving demand for patient throughput and capacity management solutions during the forecast period in the North America region. Across the globe and in North America particularly, patient throughput and capacity management solutions enable better and timely care for patients and consequently reduce the duration of a patient’s stay in the hospital. Patient throughput and capacity management solutions track patients’ clinical data and assigns the nearest nurse, doctor or caregiver, which results in fastest discharge of patients from the hospital. Thus reduced hospital stay duration is a factor expected to fuel demand for patient throughput and capacity management solutions during the forecast period in North America. Managing existing resources is a critical issue for hospitals in North America. Increasing number of in-patients coupled with inadequate resources necessitates the need for patient throughput and capacity management solutions. Hospitals need to maximize the use of resources in order to provide better care and generate more revenue. In this regard, patient throughput and capacity management solutions have proven capable of increasing hospital efficiency and revenue. These solutions are offered in different modules such as real-time location trackers, assets and bed management, and patient flow trackers. Technological advancements and addition of user-friendly features are likely to further boost the growth of the patient throughput and capacity management market in the near future. Real Time Locating System segment by product type is expected to register significant growth over the forecast period in the North America region, attributed to the fact that these systems help in precisely tracking the location of hospital resources, thereby enhancing efficiency. This segment is the most attractive segment in terms of revenue and is expected to generate maximum revenue of more than US$ 200 Mn by the end of 2024.